I’m in Vilnius, Lithuania, where I just finished speaking to a regional conference of the European Students for Liberty. 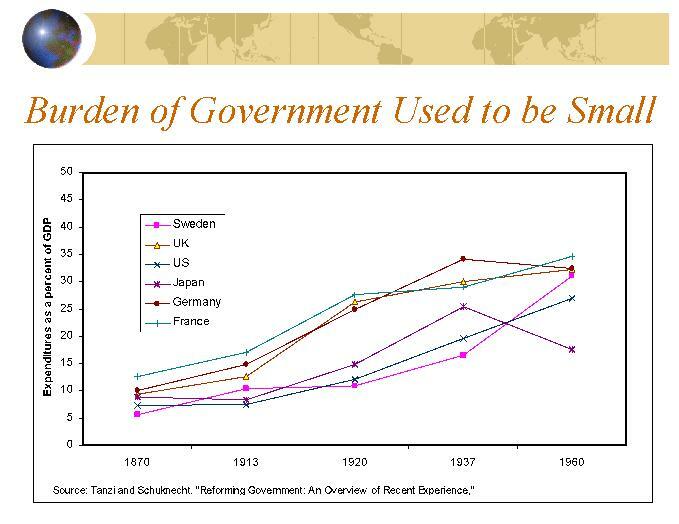 I subjected the kids to more than 90 minutes of pontificating and 73 PowerPoint slides, but I could have saved them a lot of time if I simply showed them this Rahn Curve video and then posted just one slide – the one showing that the burden of government spending in Europe used to be very small. This slide shows that government spending used to consume only about 10 percent of European economic output in the 1800s and less than 15 percent of GDP as late as 1913. I explained to the students that it was during this period of small government that Europe became a rich continent. It was back during this time that most European nations didn’t have income taxes, so there wasn’t big government to misallocate economic output, and there weren’t high tax rates to discourage economic output. So no wonder Europe went from agricultural poverty to middle class prosperity (and here’s a post where I specifically discuss how Denmark became prosperous when government was small). To be sure, fiscal policy is not the only variable that determines prosperity, and I gave some big caveats about the importance of good monetary policy, good trade policy, good regulatory policy, etc, etc. In my conclusion, I offered the students a good news scenario and bad news scenario. The good news is that we know how Europe became rich and we know that a return to small government and free markets will enable Europe to again enjoy rapid growth. The bad news is that Europe will probably move in the wrong direction rather than right direction. I shared this data from the Bank for International Settlements, showing that even supposedly sober-minded and prudent nations such as Germany and the Netherlands are going to face Greek-Style fiscal crises. Which is why I was only half-joking during the Q&A session when I suggested that the students stock up on guns and ammo. If and when the continent-wide fiscal crisis occurs (because Europe has poorly designed entitlement programs, just like America), and there’s no Germany or no IMF to provide bailouts, the looters and the moochers are going to switch from being run-of-the-mill rioters and instead become marauding gangs. In that Mad Max Dystopia, as I explained last year on the NRA’s TV program, the ability to engage in self defense will be highly prized.